1. Cut crab meat into small pieces and make sure to strain out crab juice. 2. Heat up pan and melt in butter. Add in flour and stir well. 3. Gradually pour in heated milk into the pan and stir until paste becomes creamy. Add in salt and pepper to season white sauce. 4. In another pan, melt butter and add in finely chopped onion. Then add in crab meat and honey to the onion. Fry for about 3-5minutes. 5. Add together fried onion and crab meat to the white sauce and stir well. Place in a flat caserol and spread out filling to cool. 6. Once cooled, cut crab filling into 8 servings and shape into round balls. 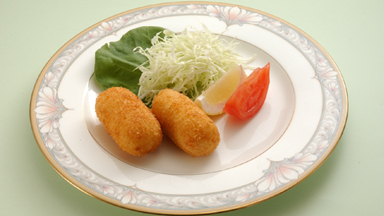 Cover shaped crab filling with flour, egg and lastly bread crumbs. 7. Deep fry in pan at high heat ( 170degrees C) until golden brown. 8. Serve with thinly sliced cabbage, tomato and lemon.